Land disputes and conflicts appear to be growing in number, intensity and diversity. This is happening along with an increasing level of difficulty for communities to establish ownership of land and a widening gap between the bargaining positions of the three main actors wanting to secure land rights: the government, the private sector and communities. These conflicts are usually rooted in a failure to deal with matters properly or thoroughly in the past. Land prices are going up as demand grows and the land supply becomes more limited. This is prompting a rush to claim ownership over land, without strong evidence or clear proof. Things are made more complex if third parties get involved who are not acting in good faith. A dispute will become hard to resolve if one side insists it is right and is not willing to discuss the matter. Problems over disputed land centre on the land itself, its boundaries, extent, status, legal ownership, the rights over the land, and the transfer of those rights. Where disputes involve government officials or the private sector, usually there are problems related to the location and extent of the land, its release, vacating the land, compensation or other payments, and the extinguishing or withdrawal of rights over it. Land problems may also involve local people using land in forests, violations of land reform legislation, access to land for development, civil land disputes and community demands for customary rights – communal as well as individual. Another cause of problems is the lack of understanding on all sides about land legislation. 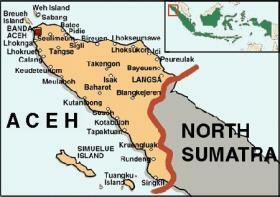 Aceh Singkil district has a land area of 3,578km2, and consists of 11 subdistricts, 23 Mukim, and 190 Gampong. The majority of Aceh Singkil’s land is in the hands of oil palm companies. There are seven oil palm plantation companies active in the district: PT Socfindo, in Gunung Meriah subdistrict with a concession of 4,414.18 ha; PT Lembah Bakti in North Singkil district (6,570 ha); PT Delima Makmur in Danau Paris subdistrict (12,173.47 ha), PT Ubertraco/Nafasindo in Kota Baharu subdistrict (13,924.68 ha); Lestari Tunggal Pratamadi in Danau Paris subdistrict (1,861 ha); PT Telaga Zam-zam in Gunung Meriah (100.05 ha) and PT Jaya Bahni Utama in Danau Paris subdistrict (1,800 ha). Of these seven companies, PT Ubertraco/Nafasindo is still in conflict with the community. The land conflict in Aceh Singkil between the local community and PT Ubertraco/Nafasindo, a Malaysian-owned company, is rooted in the same problem as many land conflicts across Indonesia: where a company holds a HGU (right of exploitation/cultivation) over an area, but has not actually developed parts (or any) of the land for a long period. Ubertraco/Nafasindo, whose HGU concession was issued for a forested area in Kota Baharu district in 1988, did not develop plantations on much of the land. This can be seen from the state of the land on the ground, where a part of the concession area has not been cultivated. The fact that there were no marked boundaries to the concession, became another problem in this dispute, and it was never clear what land was included in the HGU concession and what was unclaimed state land. Local communities used the undeveloped parts of the concession land to support their livelihoods. Currently, around four thousand households from 22 villages in Aceh Singkil are using most of this disputed land and many of them claim ownership. They back their claims with land registration certificates, land rights certificates issued by the state land agency (BPN) and decisions of the Supreme Court from 2009. Over six years ago, the company agreed to hand over parts of the HGU concession for community use. A document co-signed by Aceh Singkil district security council and PT Ubertraco on 30th August 2006, stated “…if there is community land in the HGU, this should be excluded from the HGU because it has been neglected for 20 years.” A separate document, issued by the Aceh Singkil district head the following year confirmed that only part of the HGU concession was being cultivated by the company, and that, since the boundaries were not marked, the community was using the rest. Since the community first reported the land problem to the Aceh Singkil district government in 2006, there have been various meetings and actions involving the district government, the district BPN office, the company, the 22 village communities, the Aceh government and the provincial BPN office. Various agreements have been reached and various decisions have been issued. The actions taken include documentation of the dispute and verification by the 22 villages, and collection of land rights documents. In 2010, the HGU concession was re-surveyed and re-mapped. This led to 4,000 hectares being determined as community land to be excised from the company’s HGU plantation area. All these actions were facilitated by and involved the provincial and district governments and also involved technical institutions of the provincial and district BPN offices, plus communities and company. The land that was already planted with oil palms or had been cultivated by PT Ubertraco/Nafasindo, but which, according to the redrawing of the boundary by the provincial BPN office, fell outside the company’s HGU area, was to be transferred to the community via the district government, accompanied by the Singkil-based NGO Gempa, and under the supervision of the provincial government. The public facilities, state assets, settlements and lands cultivated by the community inside the company HGU should be made into enclaves for community use. Permanent boundary markers needed to be put in to replace the temporary boundary markers installed following the redrawing of the boundary by the Aceh provincial BPN office. PT Ubertraco/Nafasindo objected to these instructions and lodged an appeal in the administrative court, but this appeal was rejected in mid-2011. Towards the end of the year and over the first months of 2012, instructions from the governor for the boundary work to go ahead were issued. However the work – which involved two people each from the provincial and district land conflict resolution teams and two people from the company, with police security assistance – was delayed several times, not least because the police were needed to provide security at the local elections in February 2012. The original HGU concession issued in 1988 covered 10,917 hectares but this had been mostly left unattended until 2004. Before the concession was issued, the community had managed the forests, utilising non timber forest products such as rattan, tree resins (damar and gaharu), sandalwood, the raw materials for mosquito repellent, honey, shellfish etc. When the HGU was issued to PT Ubertraco, at first many people did not know about it because there were no boundary posts. Due to the lack of marked boundaries and the land being left undeveloped, from then on part of the HGU land continued to be used by the community to harvest non-timber forest products and plant durian, mango, langsat and other fruit trees. The permanent boundary posts were put in by the Central BPN office without involving the Singkil authorities, the community or the local BPN office. Technically the permanent boundary markers were installed by employees of Ubertraco/Nafasindo without any BPN staff being there (apart from for two symbolic marker posts). Several markers were even put in at night, for reasons unclear. The boundary markers were not put in according to the coordinates taken during the boundary revision in 2010. The Singkil BPN office issued certificates which overlap with the disputed land: land ownership rights in the name of individuals overlap with the HGU certificates in the company’s name. There were also proofs of land ownership in the form of decisions on appeals from the Supreme Court. The oil palm plantation land managed by the community, as well as the areas under cultivation by the company in Singkil district are in an area of peatland (on average more than 2 metres deep) which are an integral part of the Singkil Swamp Wildlife Reserve. Part of the Ubertraco’s HGU area is covered by customary ownership rights of the indigenous Galagala people who have owned it for many years under individual as well as communal rights (as confirmed in a letter from the Galagala Raja transferring customary land ownership rights to the Galagala people on condition that this land cannot be traded). A water source, the Lae Bungara Lake, in Lentong village, Kuta Baharu subdistrict, is located inside the oil palm plantation HGU land. Palms have been planted up to around 5 metres from the edge of the lake. The central BPN office has annulled the whole resolution process undertaken by the provincial and district government teams. Moreover, BPN central office has also declared that the map drawn up by BPN Aceh, which the result of resurveying the land in 2010, cannot be used because it is illegal. Efforts to resolve the land conflict in Aceh Singkil have been carried out by the government, both at district and provincial levels, but up to now, there has been no agreement between the community and the company involved. The biggest problem is the conflict of interest and policy between centre and region, where steps taken by the central BPN office represent a failure to respect Aceh’s autonomy. There is now a time bomb waiting to go off in Singkil because BPN central office overrode the decisions and agreements made at regional level. With the election of a new leader in Aceh, we all hope that this conflict can be swiftly resolved and that a new leader means new energy to resolve conflicts in Aceh, especially the one in the Land of Hamzah Fanshuri. If the government wants to issue HGU licences, it should first have a look at the situation on the ground, to avoid mistakes later on. A lot of data used by the government is old and needs updating. Every activity, programme or project a company or the government wants to carry out which will have an impact on the community (whether this is a positive or negative impact) should go through a process of Free, Prior and Informed Consent (FPIC) to prevent conflicts further down the line. Aceh Singkil is known as the Land of Hamzah Fanshuri - a well-known Ulama (Muslim scholar) during the Sultanate of Iskandar Muda. Hamzah Fanshuri came from Aceh Singkil and is buried there. A mukim is the Acehnese customary legal unit of governance between gampong (lowest level of customary governance) and sub-district. The Muspida – Musyawarah Pimpinan Daerah in Singkil includes district level police, military, legal and religious leaders – DTE. The indigenous Galagala people are a small ‘kingdom’ whose territory covers part of Aceh Singkil district. They use the land to live on and to farm.